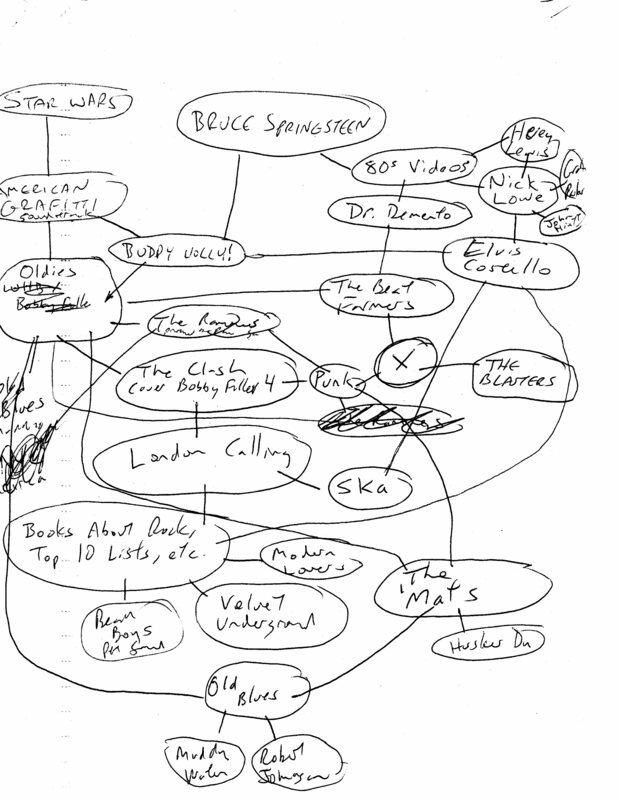 I found this chart (see below) in an old notebook. It’s my first attempt to graphically explain how science fiction and rock music are connected in my nostalgia. I’ve said that I blame pretty much every cool thing that happened to be prior to the age of 15 to either Bruce Springsteen or Star Wars. I forgot, however, that I’d attempted to actually visualize it prior to starting You Sell Wonderment. This entry was posted in All Posts and tagged American Graffiti, Bruce Springsteen, Graham Parker, John Hiatt, nostalgia, Science Fiction and Music, Star Wars, The Ramones. Bookmark the permalink.